Mount Seton S2-peak on South ridge. See this summary for a quick overview of the peaks climbed on this trip. See the information on Mount Seton. To reach this peak along the easiest way, one should first follow the route described for Mount Seton. until reaching the upper valley. There is a ridge going east from Seton-S2. 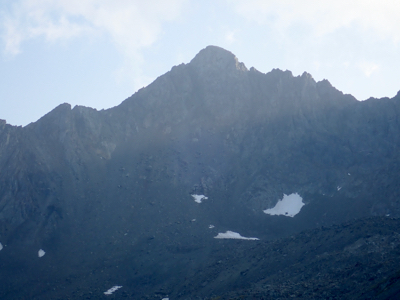 This ridge is south of the two lakes in the upper basin that are referenced in the route for Mount Seton. Ascend this ridge and follow it until it meets the main crest extending south from Mount Seton. Turn north and scramble tol a fine summit.